CMS has focused on preventive care by increasing the financial incentives, and commercial insurances are following its lead. This has placed new demands in care delivery. Patient engagement requires care providers to pro-actively reach out to patients. Preventive care also adds to the number of patients in the system, demanding care providers to improve its efficiency and effectiveness in care delivery to scale their bandwidth. Zoeticx ProVizion Application suite is about Care Resource Planning, enabling care providers to effectively deliver preventive care services. Zoeticx has proven solutions for all preventive care services – Annual Wellness Visit, Chronic Care Management, Transitional Care Management and Remote Patient Monitoring. Zoeticx ProVizion Application suite addresses all CMS requirements for all preventive care services for reimbursement and augments care providers bandwidth. Zoeticx ensures that care providers maximize the potential revenue without major investments – both in staff and IT resources. Zoeticx ProVizion transaction-based business model enables care providers with Net New Revenue / No Upfront Risk, facilitates preventive care services adoption. Zoeticx ProVizion Wellness addresses all CMS requirements for Annual Wellness Visit (AWV). ProVizion Wellness includes Care Resource Planning and integrated progress reporting capabilities to increase efficiency and effectiveness for care providers’ Net New Revenue derived from AWV service. Zoeticx ProVizion Wellness analyzes data of eligible patients from existing EHR deployment, helping care providers maximize their financial opportunity from AWV service. 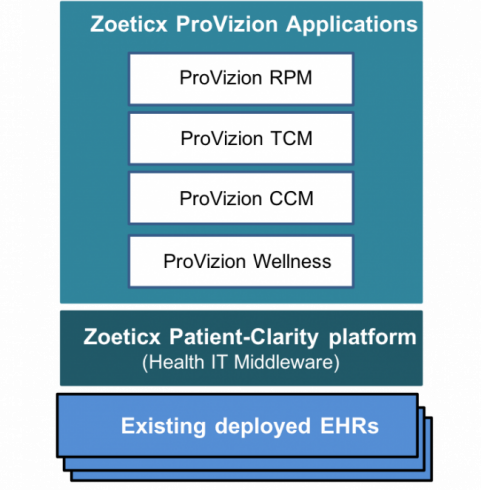 Zoeticx ProVizion Wellness integrates with the deployed EHR system and improves care providers’ efficiency by removing all manual interventions. ProVizion Wellness offers step-by-step wellness assessment guidance, reducing staff training. Zoeticx ProVizion Wellness further assists care providers better manage the risk factors to medical disease mapping, personalized to individual patients. This capability further increases care providers’ revenue through follow-up visits and provides a seamless migration to further preventive care services such as Chronic Care Management Services. Zoeticx ProVizion Wellness leverages the Accountability Service for its ability to track all activities from Zoeticx applications. These capabilities enable Zoeticx ProVizion Wellness to support future data analytics, log / audit and support for billing. Elders (>65 years old) with multiple chronic conditions are eligible for Chronic Care Management Service (CCM). CCM service is the first non face-to-face reimbursement supported by CMS, aiming at encouraging primary care providers to monitor, anticipate and collaborate with other care providers. CCM service is part of the overall initiatives aiming at shifting acute care cost to preventive care cost, proven to be a 6-1 ROI ratio. CCM reimbursements are currently expanded from its original roll-out in 2015 to include complex CCM and initial CCM engagement. The challenge for offering CCM service is that existing health IT solutions are limited to the ‘brick and mortar wall’ of the health institutes as well as the unidirectional information flow. ProVizion CCM supports for bi-directional information flow between the primary care providers and other car providers by leveraging Zoeticx Patient-Clarity platform. ProVizion CCM inherits the transaction-based business model from the application suite, enabling primary care providers with Net New Revenue / No Upfront Risk as compared with today challenges for adopting CCM service. Complete audit and log reporting capabilities in support of 20-minute engagement per month as outlined by CMS. Simplified dashboard activities to address all TCM requirements for improved care providers’ efficiency and effectiveness.